Some of the best sausages in the state can be found in the Northern Illawarra! Just in time for BBQ season, a Thirroul butchery has picked up several prestigious awards for their excellent creations. 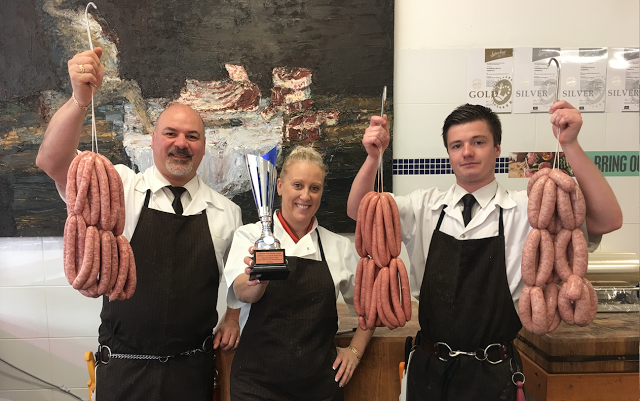 Purebred Meats Thirroul took four out of a possible six first place awards at the Australian Meat Industry Council Regional Sausage Competition, taking second and third in the remaining categories. Owners and operators and Peter and Marian Deiure are thrilled with the win, saying the secret to a great sausage is fresh ingredients combined with lots of love and a passion for food. Purebred Meats Thirroul went on to be ranked third in the NSW and ACT Finals for their now-famous Tasmanian Apple Cider Sausage, one that makes Marian proud because of her Tasmanian heritage! “It’s a pork sausage with fresh apple pieces and apple cider,” says Peter, who says his real favourite is their Italian chilli and fennel sausage, which is an old family recipe.